Deep Silver announced that NASCAR '14 will launch in North America on February 18, 2014 on Xbox 360, PlayStation 3 and PC for the suggested retail price of $49.99. "Deep Silver is releasing the best NASCAR racing experience yet to hit video game consoles," said Deep Silver Inc. COO, Geoff Mulligan. "Fans will soon be able to compete in recent high profile races, experiencing the exact same conditions the real drivers faced. With an aggressive post-release content plan, NASCAR '14 is a game NASCAR fans can enjoy all year long." Fueled by high-octane intensity and the opportunity to relive the best NASCAR moments from both the 2013 season packed into the game plus regular downloadable content updates as the upcoming season progresses, NASCAR '14 offers fans the most complete NASCAR® experience yet. Recently NASCAR revealed that more than 700,000 votes were cast worldwide in the "Drive for the Cover" contest as fans voted Tony Stewart, the three-time NASCAR Sprint Cup Series champion to appear onto the cover of NASCAR '14. The injury that kept Stewart off the track didn't stop fans of the driver of the No. 14 Bass Pro Shops / Mobil 1 Chevrolet for Stewart-Haas Racing from beating another fan favorite, four-time champion Jeff Gordon. Stewart plans to return to the track for the Daytona 500 race in February, the same month NASCAR '14 hits store shelves. Pre-order offers at Walmart, Gamestop, Best Buy, Target and Amazon may include diecast cars, exclusive paint schemes and more. 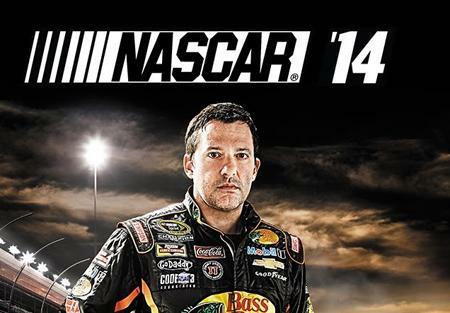 NASCAR '14 will be available for Xbox 360, PlayStation 3, and PC on February 18, 2014. For more information please visit the 360-HQ Xbox 360 Games database or the official site. Xbox 360 Games: NASCAR '14"